Performance momentum only happens when people are clear about the strategic direction, objectives, values, and how they fit. Alignment and engagement drive momentum. Vibrancy is evident, in (and for) the business and the people who work there. A vibrant business is one that holds the highest value, stays ahead of competition, and is a great place to work. The people, processes and policies that drive performance momentum are key to business vibrancy. If processes, policies and how managers manage is all about managing work, and not about building teams, you may have performance management but you won’t achieve performance momentum. Only with performance momentum can your business be fully vibrant. 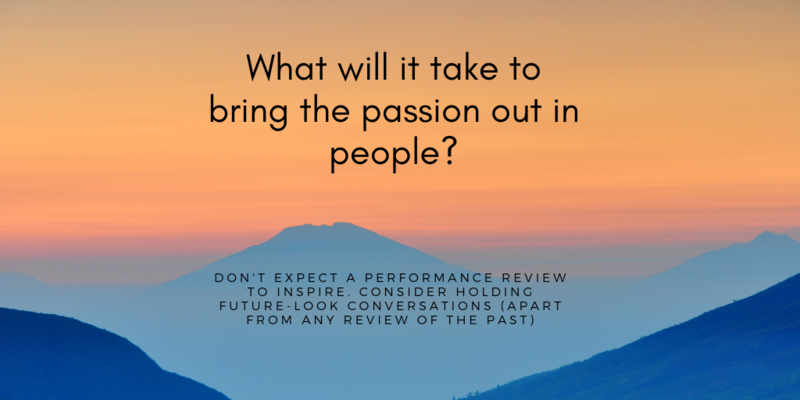 In Part 1 and 2 of this 4-part series I describe reasons why performance reviews may be ineffective or even harmful: people, mainly managers who should not be managing people, and/or the workplace context and its affect on performance reviews. Context includes processes, policies, structure, flow of communication, etc. Context is what makes your workplace unique, and what your employees experience there, day to day. Remember, you can’t change a person but you can change their context. What is it about the context of your workplace that could be causing performance reviews to fail? I suggested looking for the context in your workplace that could very likely be causing performance reviews to fail. Even the term “management” is believed by many, and reinforced by the workplace context, as “control and command.” It takes some time to un-learn traditional ways and beliefs that no longer serve you or what your vision. Changing the context comes before beliefs can change. Changing beliefs is required to change actions. What is required is an orchestrated change (a Pivot) comprised of shifts from likely every person in your organization. Orchestration takes time, but you can experience quick wins along the way. A quick win is a benefit realized while advancing toward your desired state, prior to achieving that state. Let’s say that your desired state is that overall performance of your existing workforce is high; you wouldn’t hire any differently if you could choose people again; you are identifying more individuals to promote rather than always reaching outside; delivery timelines are gaining raves and repeat business with clients; and readying, selecting and retaining the talent for now and the future is no longer daunting. A quick win could come from initiating future-look conversations. In a vibrant business, performance is reviewed and also inspired. Future-look conversations can inspire a high level of performance. They bring out authenticity and passion in people. They provide a “north star” for an individual that is aligned with the strategic direction of the organization and their role(s) in it. Reviews of past performance can be motivating. They establish understanding and agreement of how (clearly communicated) expectations have or have not been met. They also provide a baseline from which performance can be improved. Your role as a leader is to orchestrate the many small shifts made by many people toward a better way, in this case, meaningful performance reviews and inspiring conversations about future performance. Part 4 of this 4-part series on performance reviews will identify a few best next steps toward performance momentum including effective performance reviews.